On average, we spend about eight or nine hours per day at work. For many of us, that means eating both our breakfast and our lunch away from home. This shouldn’t become a problem, except, because our days are busy and deadline-driven, it’s easier to run down the road for a burger and chips than it is to prepare your our lunch. Fast food is becoming the staple diet of many urbanites, and as a result we’re becoming unhealthier by the day. Unhealthy eating occurs (more often than not) when you a) don’t have time to go and make a sandwich, so you end up buying fast food to save time, or b) when you see your colleagues eating fast food and you start craving it too. Banish bad eating by making time after dinner every evening to pack food for work the next day. If you can, double up the amount of food you cook for dinner and take the leftovers to work. Snacking during the day will not only keep your energy levels up, but it will prevent you from overeating at mealtimes. Keep healthy snacks in your drawer at your desk to nibble on when you start feeling peckish. Keep a stash of raw nuts, dried and fresh fruit, low fat yogurts and Provita / Ryvita. 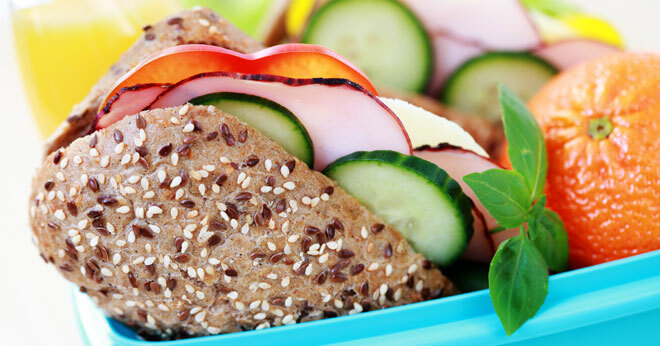 If you’re making sandwiches (always a popular choice for lunch), opt for brown, low GI bread. The same goes for mueslis and cereal bars – low GI foods release energy slower than other foods, meaning you stay fuller for longer and you don’t get that energy crash you experience after eating refined starches and sugars. Soups and salads are great alternatives to sandwiches for the office. Prepare them fresh to enjoy the goodness of the fruit and veggies! And for those who think a salad can’t be filling enough – add some avocado, chicken strips, feta cheese or cashew nuts to make it more substantial. It’s tempting to buy cold fizzy drinks or warm lattes during the day, but the amount of sugar we consume through our drinks is skyrocketing! Keep a bottle of water in the fridge for warm days (you can add chopped cucumber, lemon or strawberries to it for a subtle flavour) and keep a selection of herbal and rooibos teas at your desk for colder days. These can always be sweetened with a teaspoon of honey if you find them too bitter. Not only will these tips help you live a healthier lifestyle, but they’ll help you save money too! Treat yourself to something special with the money you’ve saved all month by not eating out – an incentive always help! Thanks for the reminder tips. Water water water, I constantly need to keep reminding myself of how important it is for the human body. With a diabetic in the house it is important for us to eat right, all the time. But after a week away from home it is often difficult to not have bread as a staple. This has been very helpful. Thank you very much! I will definitely be keeping tea and honey at my desk. Great tips. I actually need to start doing this for myself since I have a very bad habit of eating junk food while I am trying to stay fit. Wonderful article; going to make use of these tips. Great tips. I started & it’s really not easy but I’m sticking it out. I need to eat healthy, especially water. Lots of water! I need to eat healthy, especially after the festive season. The picture of this article caught my eye, and looks so healthy and yummy. Definitely going to start eating healthy, cause sometimes I just eat anything just cause I have to eat, but these tips will make my lunch time more interesting. I cannot afford to buy lunch and have been packing lunch since I started working and only treating my self with bought food very rarely. This is a great idea for the lunch tin! Will be keeping it in mind!